There are several excellent quality TV headphones for the hearing impaired (sometimes called TV hearing aids) that include features like voice clarification software and tone control, that make watching TV much more enjoyable. They are usually wireless devices that use either radio frequency or infrared light to transmit the sound from the TV directly to your headphones, which means no more arguing with anyone over the volume of the TV. Most of these wireless headphones for the hard of hearing can work with any TV set, are easy to set up, and are very easy to use. Almost all of the TV listening systems use the same basic design: you have a transmitter that you plug into the back of your TV, and a receiver (the headphones). The transmitter sends the sound from the TV to the receiver which goes right into your ears via the headphones. It means that you will be able to hear the dialogue much more clearly and you won’t have to worry about background noise interfering with your TV watching experience. 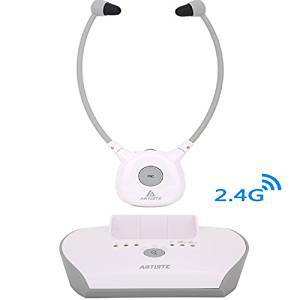 If you have had problems in your household over the volume of the TV with any of your family members, these headphone based TV listening aids are well worth the money. There are a few things to be aware of before you purchase any of these types of devices. Radio Frequency (RF) or Infrared (IR) –Whether you choose a headset that uses RF technology or IR technology depends on how you are going to be using the headphones. 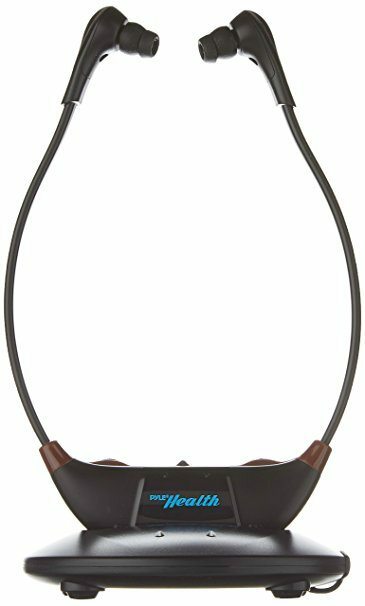 If you are planning on only using the headphones to watch TV while you are in view of the TV and don’t plan on moving around, you should look at headphones that use IR technology. If you are going to use the headphones while moving around your house and still want to hear the TV, hi-fi system or radio, then RF headphones are the best option. Compatible with your TV – Most wireless headphones will work with any TV. 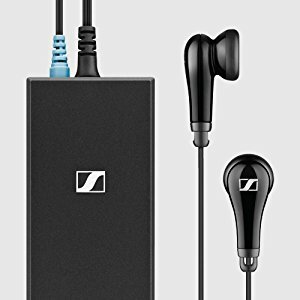 If the headphones are an older model or if you have a complicated TV setup, you should contact the manufacturer if you are unsure whether the product will work. Earphones/headphones – This is probably the most familiar style. They are the regular headphones that are placed over the ear to listen, without other people hearing. Stethoscope Listeners -Lightweight and comfortable headphones that hang beneath your ears. These are not suitable for hearing aid wearers. Neck Loop- If you wear a hearing aid you will want to find a device that has a neck loop listener. 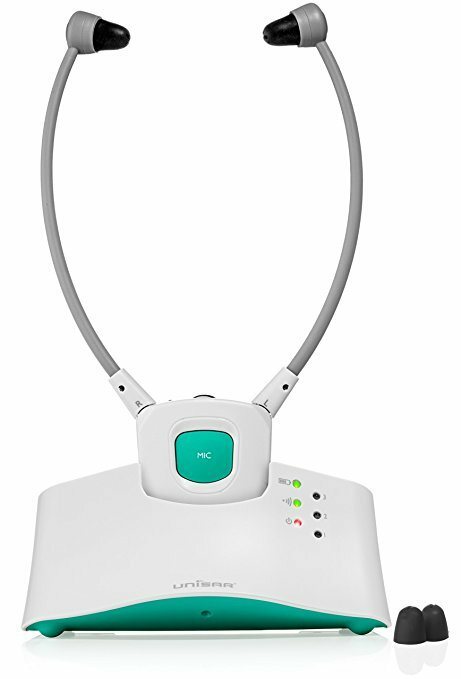 The neck loop wirelessly sends sound into your hearing aids. The t-coils in your hearing aids act like little speakers in your ears. Sound Quality– If you are very picky about sound quality you may find that RF systems may not sound as good as infrared (IR) sound, but honestly most hard of hearing users will not be able to tell much of a difference between the two types. Comfort- If you are going to be using the headphones for long periods you will want to make sure you purchase a device that will have a headphone style that is comfortable for you. If you don’t enjoy wearing the traditional style of headphones, you may want to try out Stethoscope style (sort of looks like a stethoscope) that hangs down from your ears. They are pretty comfortable as far as headphones go. If you watch TV for long periods or you wear a hearing aid, you may not want to go with a headset style listening system. If you like the idea of TV listening system but don’t want to wear headphones, there are portable speakers that you place beside you, or the Audio Fox Wireless speakers that attach to your chair, sofa or bed that might be a better option. Running time-Most devices run on some type of rechargeable battery. The battery is usually in the receiver (the headphones), and when you are finished watching TV, you will place the headphones onto the recharger, so they are ready to be used next time you watch TV. Generally, most headphones should last between 6 and 8 hours. If you watch TV for more than this amount of time, you may want to look into purchasing two receivers so one can be charging and ready to use if the first set runs down. Durability- Some of the models of headphones have a reputation for being somewhat flimsy and easy to break. Check reviews for information on the longevity of any of the headphones you are considering buying. 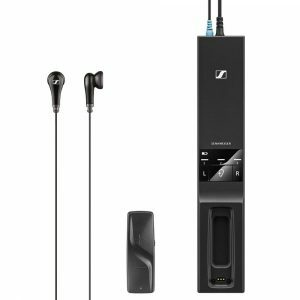 Set up and ease of use – Most of these types of headphones have been designed to be easy to install by connecting the transmitter to the back of your TV. Where you may run into problems is if you have a complicated TV system setup or you have a wall mounted TV where it is hard to get to the back of the TV. The headphones should come with all of the wires that you need to attach to your TV. The Flex 5000 is an excellent TV listening system that is easy to use, easy to set up and has great sound quality. The system has a sleek transmitter base that connects to your TV, and the audio is sent directly from the television to a small receiver that you plug your headphones to. One of the standout features is a speech intelligibility button, so conversations on TV are clear and easy to understand. Users love that the sound quality is outstanding and the setup is straightforward. The “speech intelligibility” function works well, making programs much easier to understand. The battery lasts a 12 hours usage after only 3 hours on the charger. It uses radio frequency (RF), so you don’t need to have a line of sight between the transmitter and receiver. Some users may find the headset uncomfortable if worn for long periods. It is a great TV listening system that has exceptional sound quality, is very easy to set and gives users portability because they can move around their house with the headphones on and still hear the transmitter (whether it is a TV, radio or stereo). The Sennheiser Set 840 uses voice clarifying software, so it helps clarify dialog at the same time reducing background noise for a more enjoyable TV watching experience both for the hard of hearing and others in the household who have been living with a TV set at full volume. The headphones are lightweight and comfortable to wear because of its flu exile ear pads. 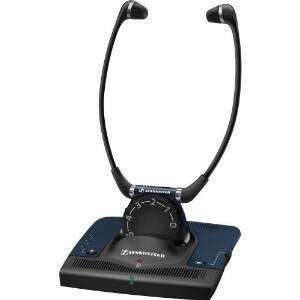 Users love that the Set840 can fine-tune the dialogue when there is background noise; the sound quality is one of the best that you will get from this type of product. People also love that the headphone is light and easy to use and that they come with a selection of ear attachments, so you can choose what works for you. People who love to move around while watching TV or listening to music also like the ability to walk around the house with the headphones on and still hear the TV. It is a reliable budget transmitter and headphone system that will help people with hearing loss watch TV. It has great reviews, and people seem to like the price and the sound quality that you are getting. Users love that this is a great budget alternative to help hear everything without having to turn up the TV and bother other people in the room. The earphones are comfortable and well cushioned for the price you are paying. Which type of technology is better, Infrared or Radio Frequency? The two leading technologies that are used with TV hearing aids are FM and infrared. Both are considered good, and each has advantages and disadvantages depending on the level of hearing loss. FM systems use radio broadcast technology that can go through walls and ceiling, so they tend to be good options if you move around a lot and still want to keep listening while in another room. Infrared systems guarantee privacy because light does not pass through walls. They are the best choice for situations such as court proceedings that require confidentiality or residential complexes where there might be high wireless usage and will have the least amount of interference from other devices. With the different types of devices, there are several features that you will want to be aware of when you are purchasing these types of systems. Volume Control – Being able to modify the volume of the device is a must-have feature to ensure that you can customize the device to your specific hearing level. Almost all devices will have this control. Range – Some systems will give you a range of up to 45 m. For most television watching situations, a range of between 10-20 m should be sufficient. Bluetooth -There are a couple of listening systems with Bluetooth that let you pair your TV and Bluetooth cell phone to the listener, so you can take calls with your listener headset and switch back to the television when your call ends. If you are interested in this, have a look at the Clearsounds Bluetooth TV and Audio Listening System. Hearing Aid /Telecoil Compatibly – For anyone with hearing aids fitted with telecoils many hearing-aid-compatible IR TV listening systems feature receivers designed to connect directly to your hearing aid, or an installed induction loop. 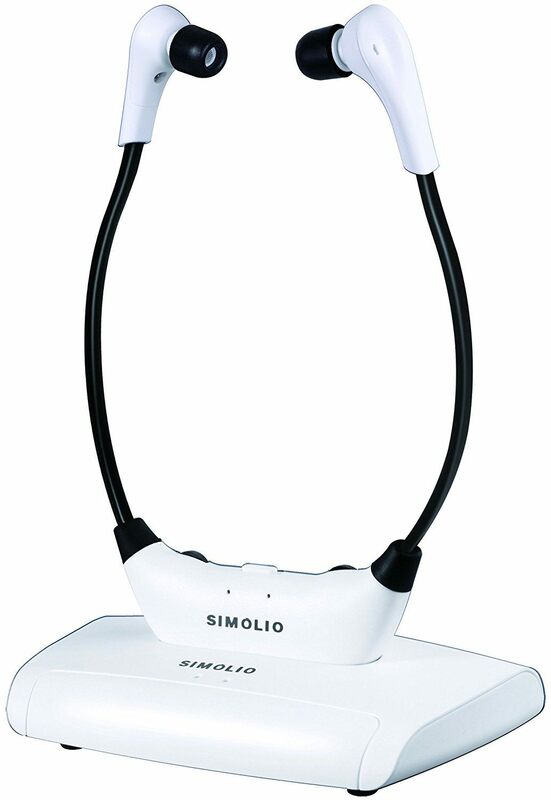 Other IR systems feature neck loops that broadcast a signal directly to telecoil-equipped hearing aids. Transmitter – All of these devices to help you watch TV have a transmitter that usually requires a power source. Most transmitters are quite small, and you shouldn’t need a lot of space to store them. They are most commonly plugged directly into the back of the television. Receiver – The receiver is what is worn by the listener. 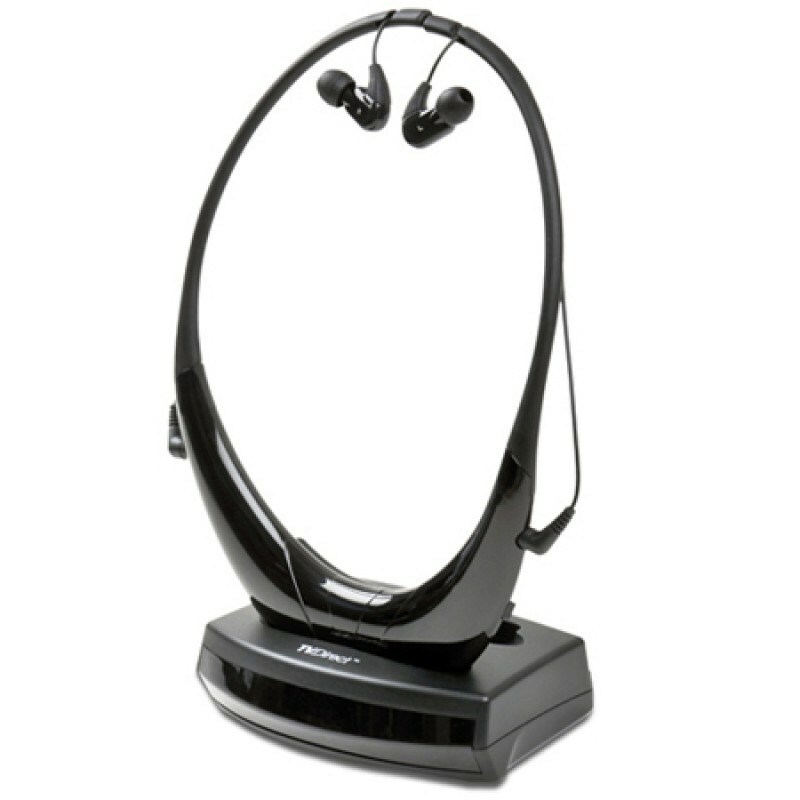 The receiver can be a hearing aid, headset (headphones), neck loop, or body pack. Generally, they have rechargeable batteries that will be charged when the device is not in use and placed back on the transmitter charging cradle. Headphones – A lot of the listening systems have a wireless headphone that is battery powered, and the transmitter generally serves as the battery charger, as well as the place where you would store your wireless headphones. If the headphones are wireless, it is a good idea to check how long is the operating time and the charging time for the headsets. Wireless headphones that have voice clarifying software included are an excellent investment for anyone who has trouble hearing dialogue while watching TV. Investing in this type of product means that you don’t have to turn your TV up full blast just to hear what is being said saving a lot of trouble with your family and perhaps your neighbors.